evangelizing the (digital) natives : Chicken or the Egg - Whose Learning Should Schools Prioritize? 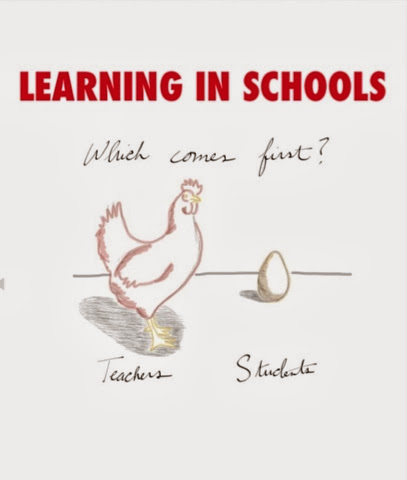 Chicken or the Egg - Whose Learning Should Schools Prioritize? 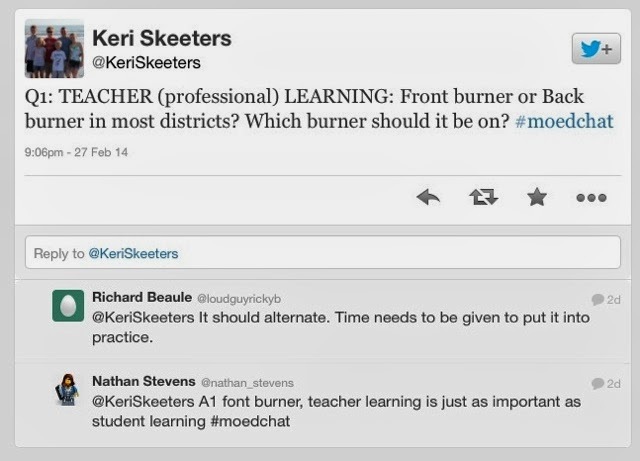 The topic for Thursday night's #moedchat was "Out of the Box PD". I guess the first question was my favorite, because I'm still thinking about it. I didn't get the feeling that it was a very popular answer - maybe only because the focus of Thursday's chat was on TEACHER learning - but the more I reflect on it, the stronger I'm convicted. Wrapping it as a chicken/egg paradigm instead of front burner/back burner makes it a slightly different question, but the principle remains. Student learning should be the primary focus of a school or distict over teacher PD because teacher learning would have to be a part of the discussion to serve that goal. What happens when teacher learning comes first? Reflecting on my own career gives me a few things to consider. 1. Saying the right thing and having an instructional plan that LOOKS good takes precedence over evidence and results. We can have high-quality PD and high-five each other for the great conversations we have at edcamps, other conferences, or on Twitter chats, but there's a big step between knowing best practice, attempting best practice, and ACHIEVING best practice. In my own experience, when MY learning is most important, its tempting to blame anything that is unsuccessful in my classroom on various student factors. "They didn't try hard enough." "They didn't listen to my directions." 2. PD that does not focus first on the impact of a strategy or tool on students serves only the people in the room. I am not a fan of "cool tool" sessions at conferences or PD trainings that focus on one particular tool, because in my own experience, my excitement to squeeze that tool into my own classroom sometimes results in a negative impact on learning as students hurdle the tech to learn the content or demonstrate their learning. If "how will my students use this" or "what challenges will my students face" is the first question, we risk complicating an environment that is already difficult to navigate for high-needs students. The first semester I had iPads in my classroom, I tried giving a final exam on the Socrative "clicker" app. From my perspective, this was a slam dunk. My students had already used the app several times, so I knew they liked it, and while you could not put images into your Socrative quizzes at that point in time, I had gotten around it by printing copies of the exam with Socrative setup as a bubblesheet. What I thought was the big advantage for me and the kids was that Socrative was going to score their responses as they worked, making the feedback immediate - they would not be stressing for hours to find out how they did on the final. There was only ONE problem - Socrative forces the students to work linearly through the exam, so anyone that would normally skip around and do the work they were most comfortable with first could not. On top of that, if a student accidentally pressed a response different than what they wanted, there was no way to go back and change it. Bottom line: for as much added benefit as Socrative provided with its immediate results (and easing my grading burden) the times kids were penalized for an errant finger resulted in a net impact of ZERO at best. 3. Focusing on teachers' learning needs FIRST ignore the needs of the students in their context. Instructional design 101 demands that before you prepare any instruction (or in this case, provide training for teachers to better teach the students), you conduct a needs assessment to meet the students where they are culturally, and what they bring to you in prior knowledge. The students' learning must come first because they are the school variable that is always changing! Yes, there are circumstances for which meeting a set of students will require more training for a teacher, but that is in response to the student context. What do you think? 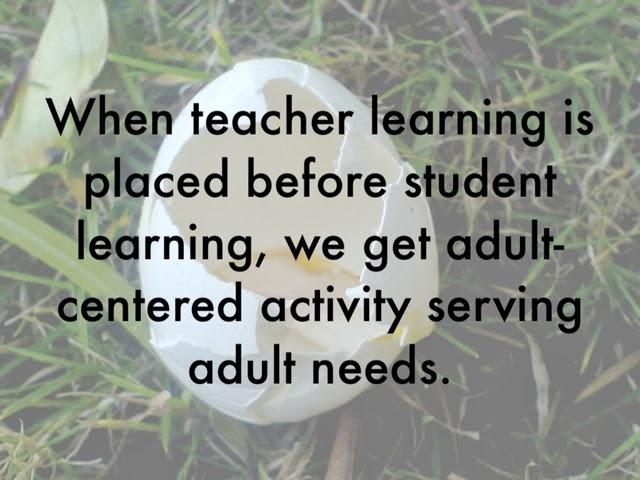 Should we prioritize teacher learning or student learning?